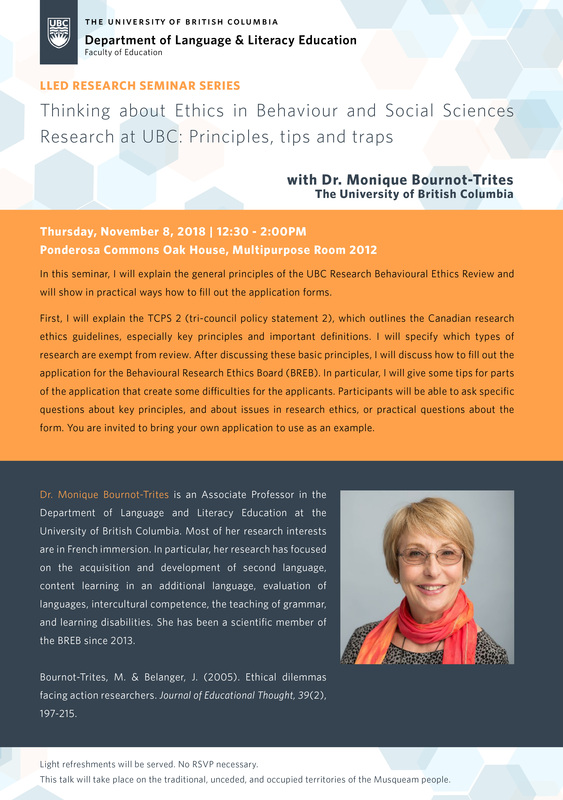 In this seminar, I will explain the general principles of the UBC Research Behavioural Ethics Review and will show in practical ways how to fill out the application forms. First, I will explain the TCPS 2 (tri-council policy statement 2), which outlines the Canadian research ethics guidelines, especially key principles and important definitions. I will specify which types of research are exempt from review. After discussing these basic principles, I will discuss how to fill out the application for the Behavioural Research Ethics Board (BREB). In particular, I will give some tips for parts of the application that create some diffculties for the applicants. Participants will be able to ask specific questions about key principles, and about issues in research ethics, or practical questions about the form. You are invited to bring your own application to use as an example. Dr. Monique Bournot-Trites is an Associate Professor in the Department of Language and Literacy Education at the University of British Columbia. Most of her research interests are in French immersion. In particular, her research has focused on the acquisition and development of second language, content learning in an additional language, evaluation of languages, intercultural competence, the teaching of grammar, and learning disabilities. She has been a scientific member of the BREB since 2013. Bournot-Trites, M. & Belanger, J. (2005). Ethical dilemmas facing action researchers. Journal of Educational Thought, 39(2), 197-215. Light refreshments will be served. No RSVP necessary. All are welcome.